Jacob shows off his main crop, maize. He took it easy on Steve when he came to work for the day. The idea was simple: work for one day on a Ugandan farm, just as a local would do, likely end up a broken man, and retell the saga of the hardship for your pleasure. By 9.45am, hoe in hand, I am decimating a patch of milk weed that is endeavoring to strangle a plot of Jacob’s maize crop, cursing myself for not having worn long pants. Each scratching sensation on my calf masquerades as a snake ready to dine on me. After about three-and-a-half minutes of hoeing, the humidity in concert with the penetrating equatorial sunlight causes a small waterfall on my neck, every single drop of sweat which drips from my hair also masquerades as a blood-yearning, malaria-giving mosquito. Twenty-five-year-old Jacob, who I had met in South Sudan two weeks previously – where he was visiting family, didn’t seem at all fazed that I had turned up over an hour and a half after the agreed time. My excuses were bullet-proof, ones that Ugandans won’t argue with: I had to wait for the share taxi to fill up for well over an hour, the dirt road on which it travelled had turned to mush after a morning downpour and it took me some time to locate the 15-acre farm, which is three-and-a-smidge kilometres in from the main road. In any case, Jacob had already been toiling away in the fields since 6am, as he does five days a week (Saturdays are for maintenance and Sunday for the soul) with the help of his live-in worker Peter, who hails from the West Nile district. Their daily routine involves working until 2pm, sometimes but rarely taking a break until 4.30pm, and then continuing until well after 6pm. During the busy dry season they won’t break for lunch; there’s more than enough cassava root (dig up, peel and eat raw) to sustain them, so it’s positively decadent to waste time heading back for a cooked lunch. Jacob allows himself the odd afternoon off in football season, because he plays an important part in a local team. Football is one of his great passions in life, Manchester United his true sporting weakness; posters, jerseys, the lot. 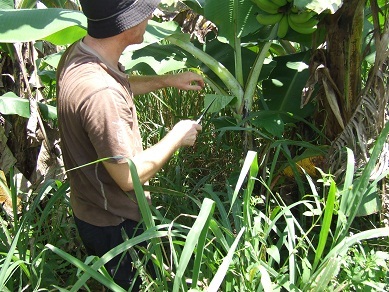 Next Jacob has me pruning leaves from banana trees; the crop yields are substantially higher if their fruit is not hindered by dying and overgrown foliage. Next we pull up some yellow beans (our lunch) with bare hands. My back reminds me that continued bending is not in its repertoire, but I don’t complain because I’ve been at it for less than an hour and two things are becoming clear cut. First, I am an unabashed hindrance to Jacob’s working day, but he doesn’t mind in the slightest. Second, he has invited me as a friend, not as a worker on his 15 acres and, as such, he is definitely taking it easy on me. Damn, Ugandan hospitality is ruining my experiment. We head in for more hospitality, an early lunch break, to the farm’s compound, which could more or less resemble a small farm anywhere. The three buildings which comprise the compound are simple concrete oblong designs, contrasting with the traditional circular ‘bandas’ that pepper the surrounding properties. The radio plays softly in the background, powered by three compact plug-in solar panels that sit in the courtyard, the only electrical power to the property. Also in the courtyard is a hand-controlled, diesel-engine-powered plough. Jacob says he’s lucky to have it, but it’s not too easy to use. Still, it’s substantially easier than yoking together a couple of bullocks, as many of the pure subsistence farmer in the area do, many of which are lucky to be ‘digging’ more than an acre, and who bring little or nothing to the local market where Jacob sells his produce on Thursdays. Next to the plough lies a colossal tan dog of indiscriminate breed. He doesn’t stir while I’m there; but reassuringly his chest rises and falls methodically. 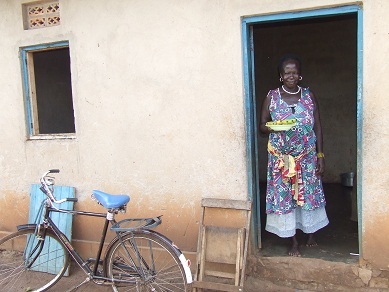 Jacob’s mother, who lives on the farm as well, along with one of his brothers, prepares beans and rice. The language barrier thwarts most of our attempts at eloquent interaction, yet she greets me in the traditional fashion (hand shake while grabbing her own forearm). She’s bubbly, probably because a muzungo (white man) is visiting the farm for the first time, cackling in a high-pitched laugh every times she hears me speak in English. She changes to an even higher gear of hilarity when she sees me applying sunscreen. Jacob says the doctor told her she has “internal leprosy” [he didn’t know the English translation, but he appears not to be referring to cancer]. She is still happy, he insists, because she can drink. Everyone in Uganda likes to drink, he jokes. She doesn’t eat with us, which seems strange. “It’s just part of our culture,” Jacob shrugs. I genuinely relish the lightly spiced beans and rice, yet Jacob doesn’t seem too fussed by them. “I have eaten beans every day of my life,” he says, the sincerity in his eyes confirming his taste-bud boredom. While we’re flipping through a thick album of photos of Jacob’s life, where education seems to have been the most important part, we dissect small-farm economics. 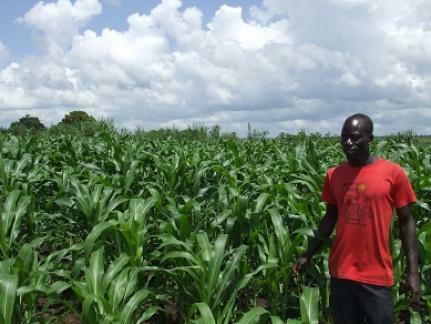 Diversification is the name of the game on this Kiriandongo-district plot: cassava, beans, bananas, oranges, mangoes and the principal crop maize, which fetches about 450 Ugandan shillings (US 16cents) per kilogram. His oranges gain about 6,000 shillings for a basin full. Strangely they are stubbornly green, despite being obviously and bulbously ripe. I try to explain to Jacob the difficultly he would encounter selling green oranges to a western market, even if they are this delicious. He doesn’t quite appreciate why finicky people would demand an orange orange. Jacob would love to farm higher value crops, such as cotton or sunflowers, but they are too labour intensive and slurp too much precious water. He would also like to start a piggery – because pigs are difficult to steal. Last year he kept 12 goats on the farm, but they were stolen by rustlers in the dead of night. He tried to track them, but they were smuggled over the border into South Sudan. Jacob is reluctantly content running the farm, which is actually owned by his uncle, who is the Catholic bishop of the area. He is not shy of hard work, in fact, he says he doesn’t feel useful when he is idle, but his dreams lay a little further afield than just these dozen-or-so acres. He would like to continue his education and ultimately become a wildlife officer, a policeman or a politician. He feels the need to help people, perhaps something that his current work doesn’t really quench. But his uncle is the head of the family since Jacob’s father died, and believes Jacob should remain a farmer, to help out the family. In patriarchal African families, you listen to your elders – especially when they control the purse strings. Winnie, 21, whose parents were killed in an accident when she was young, also seems also to be a fundamental slice of his future, farm or no farm. Jacob hints that one day he would like to marry her, but he has not saved enough money yet – and, of course, there are tribal differences to be worked through. I’m feeling lazy after the second helping of beans, but suggest we better get back to it. More milk weed to hoe? No, Jacob has promised a local lad he can finish the job. He will pay him a few shillings so the boy can pay admission to watch his beloved Arsenal game at a local pub that’s cashing in on Ugandans’ fervour for English Premier League football. Although there looks like there’s plenty to be hoed, hacked, fixed and dug, Jacob has other ideas; hospitality with a sprinkle of skiving is on this afternoon’s agenda. We’re off to the town for a few games of pool and maybe a few Nile Specials. He blames this on the clouds which look ready to hemorrhage fat rain onto the farm. He says heavy rains will form rivers which cut off the farm from the small town and that means I would be stranded for the night. Who am I to dispute such specific local knowledge? Okay, so it wasn’t the hardest day, or indeed few hours, of work in my life. But at least I learned what it takes to be an African farmer. It’s not necessarily all about back-breaking demanding work, as the clichés often dictate; it’s mostly about working smart and leaving time for the important things in life. Both Jacob and I raise our 500ml smoky-glass bottles of Nile Special and drink to that.